Santa Claus is coming to Canadiandollarbingo.com! 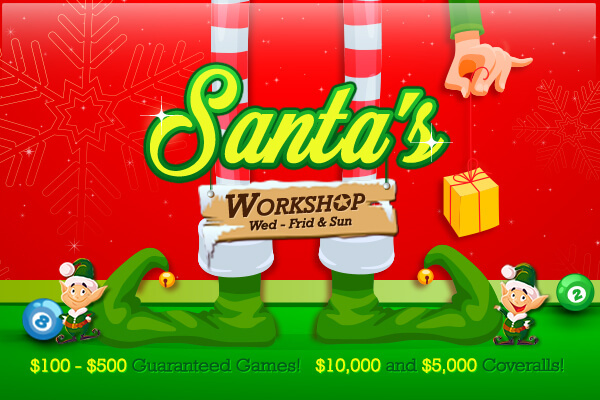 Santa’s Workshop Tourney Bingo Room will be open all December long with more chances to win, and bigger prizes to get! – How to participate? Deposit and register to unlock the exclusive room. Join the CH-Elves at Santa's Workshop for fun holiday games, lots of cash & more! This will be an unforgettable event, think of it as the North Pole jackpot factory and whether you've been naughty or nice, get ready to unwrap fantastic jackpots this holiday season. Our elves are hard at work making sure to bring you the best bingo experience on the net, don’t miss out! Canadiandollarbingo.com is part of the well-established TheBingoAffiliates network and the best site for Canadian bingo players that pays and plays in CAD dollars in most of the rooms. New members get a $50 FREE trial bonus and new depositors an incredible 1000% Welcome Bonus package. See you all in the bingo rooms! This entry was posted in Blog on Dec 5, 2017 by Canadian Dollar Bingo.